On the 17th December 2005 I am hoping to go for a day trip to Jersey to do some christmas shopping. I say hope as I was supposed to be going on the 3rd December but the weather was so bad that the boats were cancelled. At the moment the forecast for the 17th is much better, however that can all change over the next week and a half. So I came up with the idea of making a spreadsheet to track how the forecast changes. I also had the cunning idea of plotting the spreadsheet on a graph so that you folks can see how things progress. 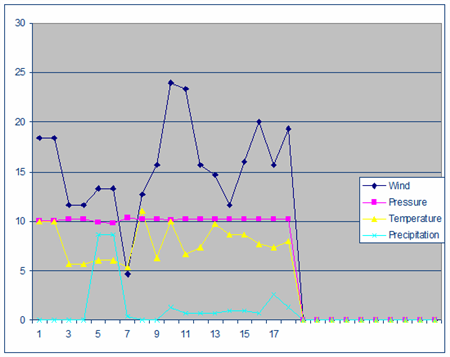 What the graph shows is the average forecast wind speed, pressure (divided by ten) and temperature for the 17th December.